Werner's Cairns blog: Eat Fat With Tomatoes to Absorb All the Nutrients. Eat Fat With Tomatoes to Absorb All the Nutrients. Tomatoes are certainly nutritious — a good source of the antioxidants lycopene and beta-carotene. But consider this: if you eat a tomato without adding a little fat — say a drizzle of olive oil — your body is unlikely to absorb all these nutrients. Scientists at Iowa State University figured this out a while ago. They recruited graduate students to eat bowls of salad greens with tomatoes and various types of salad dressings — from fat-free to regular Italian. "Basically once a month for several months we'd show up first thing in the morning," recalls participant Gregory Brown, now a professor of exercise science at the University of Nebraska. Researchers put IV lines into the participants' veins and drew blood samples before and after they'd eaten the salads in order to get precise measurements of the absorption of nutrients. "The salads all tasted the same to me," says Brown. But when researchers went back and analysed the blood samples they realized that people who had eaten fat-free or low-fat dressings didn't absorb the beneficial carotenoids from the salad. Only when they had eaten the oil-based dressing did they get the nutrients. Carotenoids are the pigments responsible for red-, yellow- and orange-coloured fruits and vegetables. And carotenoids are also found in dark green vegetables such as spinach. The compounds convert to Vitamin A in the body, and studies have found that carotenoids have anti-oxidant activity which may help protect cells from damage caused by free radicals. Human studies have linked high consumption of fruits and vegetables to reduced risk of cancer. Beta-carotene researchers were not particularly surprised by the findings of the fat-free vs. regular Italian salad dressing study. "We already knew that carotenoids were fat soluble," explains Wendy White, a professor of Human Nutrition at Iowa State University. The results helped reinforce the idea that a little fat is healthy. There are other ways to help maximize the absorption of carotenoid nutrients. Chopping or grating breaks down the plant material. "The finer the particle size ... the better the absorption of beta-carotene," explains White. The findings of nutrition research often go against the grain of trendy food ideas. For instance, many people have heard that raw vegetables are best. But if you're eating carrots, it may be helpful to cook them gently. The heat can soften the food allowing more nutrients to be released. A recent study in the Journal of Food Science suggests that some cooking methods may be better than others. Researchers at the University of Murcia in Spain cooked 20 different kinds of vegetables six different ways. Then they analysed how well the foods retained antioxidants. They found that microwaving helped maintain the antioxidants, whereas boiling and pressure cooking led to the greatest losses. Green beans, beets and garlic all did well with heat — maintaining beneficial phytonutrients after most kinds of cooking. The antioxidant value in carrots actually increased after cooking. Experts explain that boiling may allow nutrients to leach into the pan water that people end up tossing out, especially with water-soluble nutrients such as Vitamin C and the B Vitamins. As testing methods have become more sensitive, scientists have the ability to peer into our foods and tally up all the phytonutrients that may be beneficial. But experts say the ways in which our bodies may use and absorb these compounds are complicated. Therefore, many experts say it's best not to fixate too much on how food is prepared. Instead, focus on eating more plant foods — of all colours. Jeffrey Blumberg, an antioxidant expert at Tufts University, says "What's important is that you find a way to cook that's palatable to you so you're getting lots of plant foods." 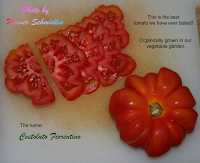 Tomatoes are a good source of the antioxidants lycopene and beta-carotene. But if you eat a tomato without adding a little fat, your body is unlikely to absorb all these nutrients. Scientists recruited graduate students to eat bowls of salad greens with tomatoes and various types of salad dressings. The researchers put IV lines into the participants' veins and drew blood samples before and after they'd eaten the salads in order to get precise measurements of the absorption of nutrients. When researchers went back and analysed the blood samples, they realized that people who had eaten fat-free or low-fat dressings didn't absorb the beneficial carotenoids from the salad. Only when they had eaten the oil-based dressing did they get the nutrients.